I’m not quite sure that I’m ready to make the statement that I prefer blondies to brownies, but it’s within the realm of possibility. 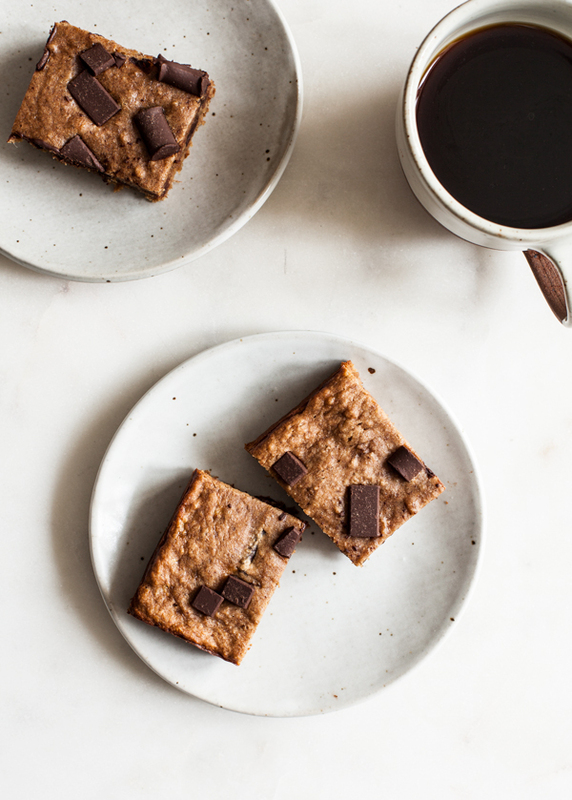 I’ve always loved blondies–it’s that contrast of a soft, almost caramel-like center with the bold and slightly bitter taste of chocolate. 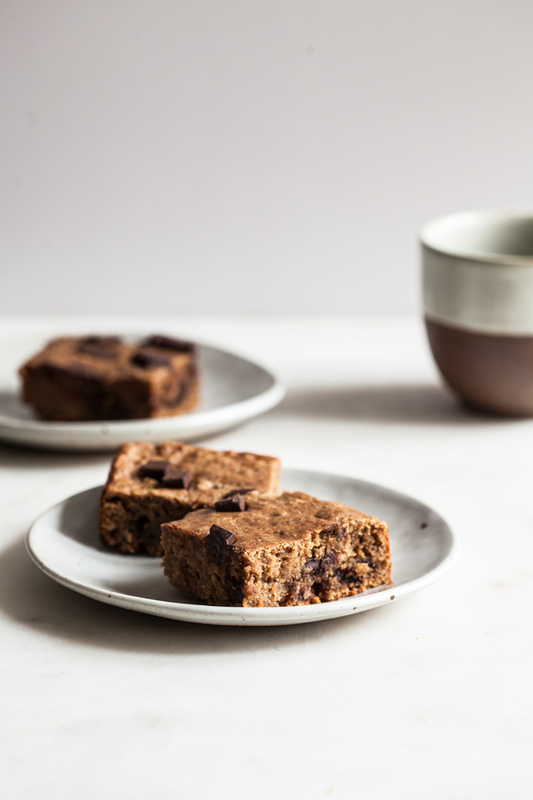 With brownies, chocolate is all you taste (well, maybe there’s a hint of espresso, too). The chocolate chunks in a blondie stand out precisely because they don’t predominate. Listening to me wax poetic here, it’s hard to believe that this is the first blondie recipe I’ve posted on the blog! 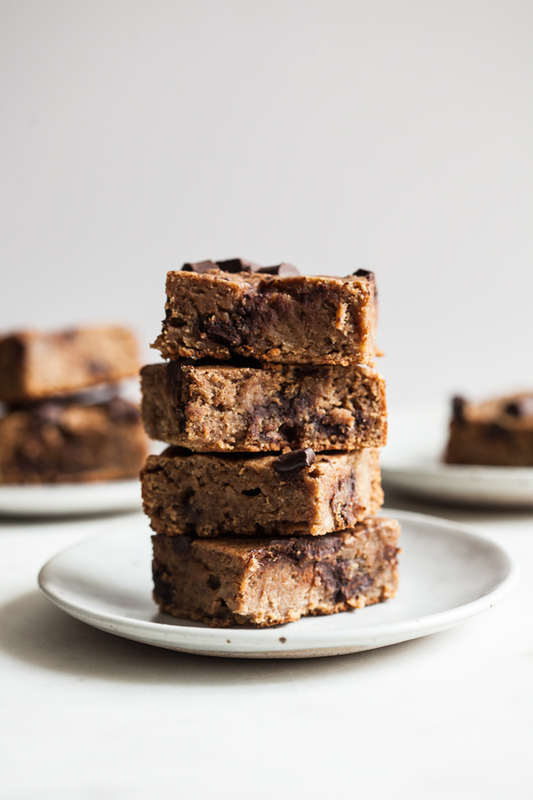 These vegan, gluten free banana bread blondies combine two of my favorite things–banana bread and blondies–into one rich, gooey, and absolutely delicious little treat. I’ve been patting myself on the back this week for having gotten through a big chunk of recipe testing for the next cookbook, with results that feel genuine and exciting. After some culinary writer’s block earlier this summer, finding a “flow” feels great. But there’s a downside to all of the cookbook testing, which is that everything I’ve been cooking has been in service of that project. I can’t remember the last time I made a meal that wasn’t either for the blog or for the book. Part of what I love about cooking is that it encourages me to be spontaneous and listen to my intuition–a way of being that does not come easily to me–and when spontaneity is drained from the process, I start to miss it. Baking isn’t the most spontaneous form of kitchen activity, but my recent blueberry corn muffins have me excited about summer baking possibilities. Plus, one of the things I love about baking is that the things it produces aren’t always functional. They’re treats, which means that they feel both special and out of the ordinary. I’ve had my nose to the culinary grindstone, so to speak, and this week, it felt lovely to make something that was just for fun. And then it was so tasty that I couldn’t help but share. I’ve been enjoying these all week, often with a cup of coffee, and always with gratitude for cooking as a form of self-care. When I talk about “self-care” through food, I’m usually talking about nutrition, about selecting foods that nourish our bodies with particular vitamins and minerals and macronutrients. But the self-care is so much bigger than that. It involves tuning into what we need–not only physically, but humanly, too–and allowing our kitchen endeavors to satisfy those needs. This week, I needed a little break from cooking that has been largely purposeful. These blondies were the answer. Maybe they’ll be a welcome treat, indulgence, or source of culinary play for you, too. Preheat your oven to 350F and lightly oil an 8x8 square baking dish. Whisk together the banana, sugar, vanilla extract, almond milk, and almond butter. Stir in the flax egg. Add this wet mixture to the dry ingredients and use a spoon or spatula to combine evenly. Fold in ½ cup of the chocolate chunks. Transfer the batter to the prepared baking dish and sprinkle the remaining chocolate chunks on top. Transfer the baking dish to the oven and bake for 25-30 minutes, or until the top is glossy and the edges of the blondies are just turning golden (I recommend checking them after 22 minutes, just to be sure they're not baking more quickly than you expected). 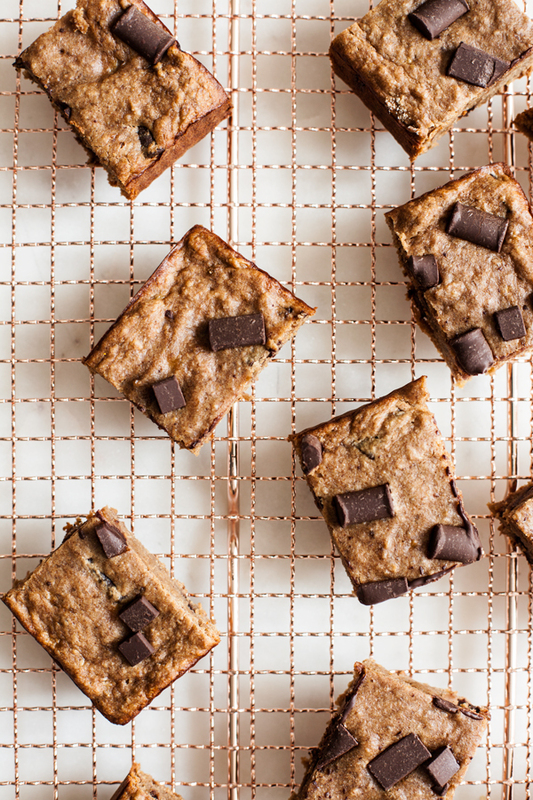 Allow the blondies to cool on a cooling wrack completely before cutting into 12 rectangles and serving. In place of the oat flour, you can use light spelt, whole wheat pastry, or all purpose flour instead. Wrap leftover blondies individually in saran wrap and store in the fridge for up to 4 days. 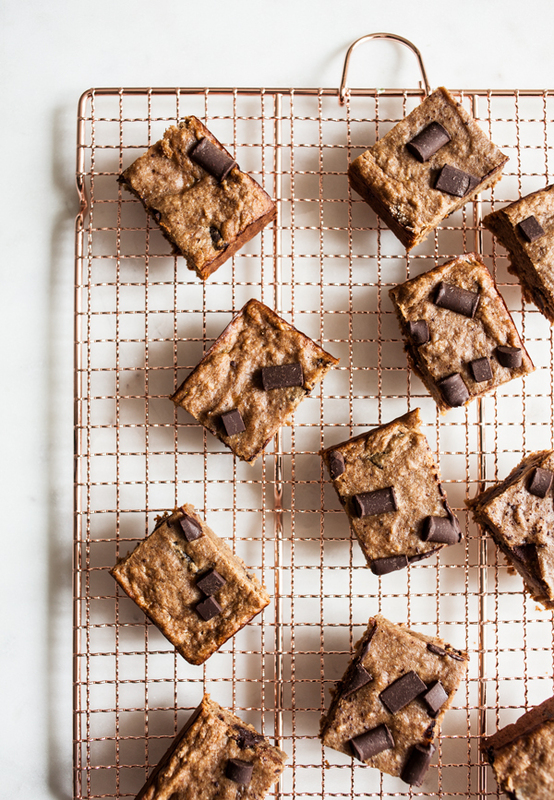 You can also freeze individually wrapped blondies for up to 3 weeks. 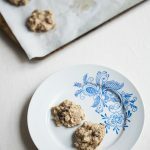 This is a simple recipe, and you can adjust it a little to suit your tastes (for example, you can use a little more or less sugar, or play around with different banana to sugar ratios). If you don’t have almond butter on hand, peanut butter will work perfectly, as will cashew butter. For those with tree nut allergies, sunflower seed butter is a great substitute. And what if you don’t share my love of banana bread–or you don’t want to combine that love with your love of blondies? I suspect that applesauce, pumpkin puree, and prune puree might all work well here in place of mashed banana. I haven’t tried them, so I can’t officially vouch for the results, but I may have to try the pumpkin version as soon as September/October roll around. If you happen to experiment with them first, let me know! On that note, friends, I’m powering down for the evening. I hope you’ll get as much pleasure and satisfaction from this recipe as I have. 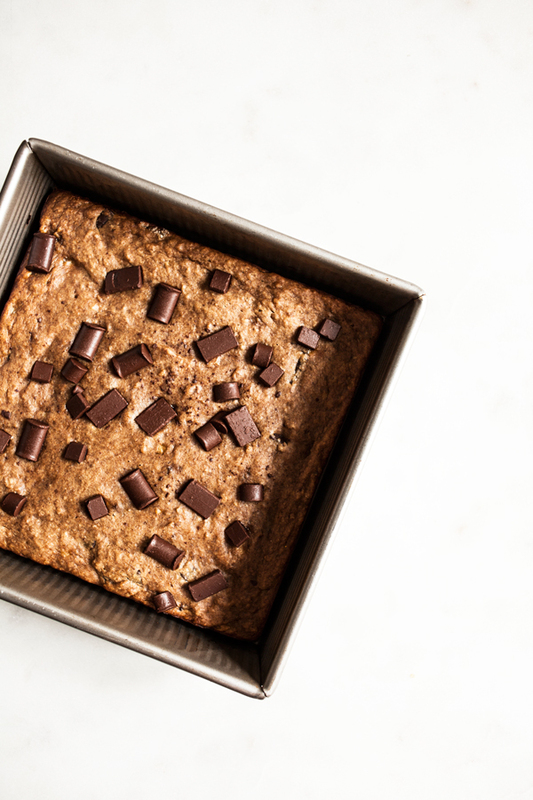 You made a great point about brownies vs. blondies. It’s true that you can kind of savor the individual flavors more in a blondie. Looking forward to seeing if you try the pumpkin version! Blondies will always be my favorite! Thank you for sharing this recipe. I’m gonna make them next week! Gosh! They look so gooey, so yummy! I made these today after seeing them on Instagram. I don’t know how I’m going to stop myself from eating the whole pan! They’re delicious! Such a quick and easy recipe. 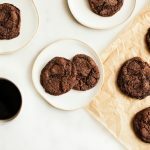 I used spelt flour, and they turned out great! Gena, these are SO GOOD. I don’t know if I’d call them a blondie but I don’t care because I love them. Thanks for the recipe. (PS: I reduced the brown sugar to just 1/4 cup and they were great). So glad you like ’em! This is a FABULOUS recipe. It could be called “Mistake-proof”. I made several mistakes (used the wrong measuring cup), used regular whole wheat flour (instead of pastry-flour), baked it in a 10″ skillet (which is the only baking pan I have), and used regular ol’ chocolate chips. And it turned out beautiful and delicious! Thank you, Gena. It was worth it to turn on the oven during a heat wave. Re chocolate – excuse my ignorance…. not used to cup measurements here in UK.. Does it mean you measure 2 x 1/3rd chips of chocolate or 2/3ds of a one third cup? These are great! I’ve made them twice now; the second time I subbed the sugar for date purée if you prefer to naturally sweeten and they were just as tasty. Thanks! Making these for a second time today! This time with peanut butter instead of almond, and chopped dates instead of chocolate chips. The bars were so moist and delicious! Thanks for the recipe! Can’t wait to try them with PB myself! So glad you like the recipe, Molly. 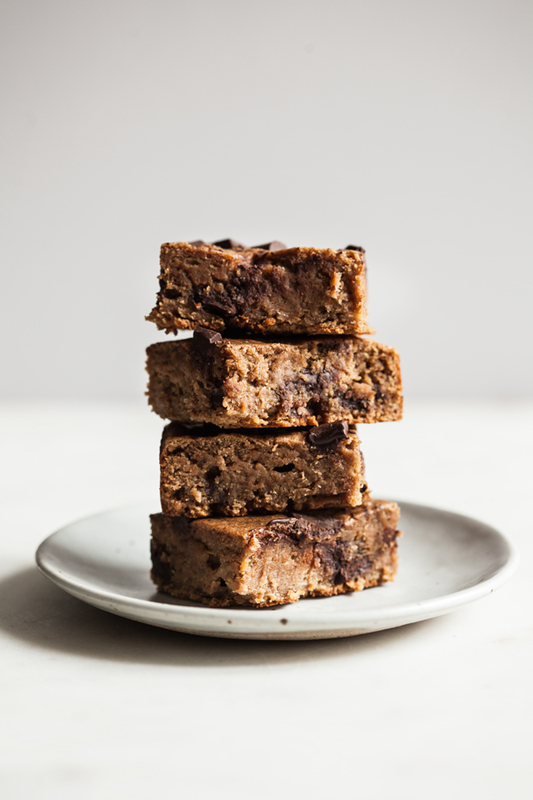 I made these using tahini as the nut/seed butter component because tahini + banana + dark chocolate = bliss. Yum. Sweet enough, so moist and dense, room for error or creativity. This “blondie” (I wouldn’t describe its flavor as a classic blondie, rather a heavenly banana square) is the kind of thing I slice off pieces and eat while standing over the sink until half of the pan has disappeared, ya know? Thank you for the delicious recipe, Gena. 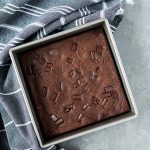 I felt like a glutton at first eating so much (I cut half the pan into 1.5 x 1.5 in squares so I could have a bite here and a bite there, and the other half into bigger bars). But then I did the math – 1/4 pan is only 1/2 a banana and + 1/3 cup oats which is perfect for a small meal/large snack. Other than being a bit more sugar than I’d typically eat outside dessert time you can kind of go to town on these and not be overdoing it. 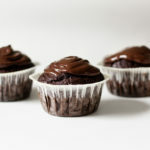 (and these would still be awesome sans a few tablespoons of sugar). While driving I had all kinds of visions of “healthy-ing” these up even more with hemp seeds, a little less sugar, maybe a tbs of molasses, other nuts, etc. ORRR like a white chocolate macadamia version…? heaven. Thanks for another fab recipe Gena!!! This recipe is the perfect marriage of blondies and loaf cakes! I subbed 1 cup applesauce for the mashed bananas, 1/2 cup maple syrup for the sugar, and 1/2 cup tahini for the almond butter. I suspected that between the maple syrup and the applesauce (which is more watery than mashed bananas), there would be enough liquid without the almond milk – and I was right. I didn’t add any almond milk, but these baked up perfectly moist after 28 minutes at 350 F. For others who don’t want a pronounced banana/fruit flavor, I’d recommend applesauce – I didn’t notice any apple-y flavor in the final product, which really let the tahini-chocolate combination shine! Thanks for a positively divine recipe. Thank you for this recipe! I made these today with a few adjustments; I used chia instead of flax, coconut milk instead of almond, spelt flour instead of oat, and completely left out the sugar. They are delicious! Between the overripe bananas and dark choc chips there was enough sweetness for my taste. Perfect for work snackage! 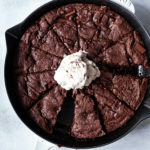 Im looking for a sugar-free dessert. Do you have any suggestions for a natura sweeter to substitute? I’m afraid I don’t—I’m not familiar working with sugar free sweeteners, and I wouldn’t want to steer you astray. I’m sorry not to be more helpful!